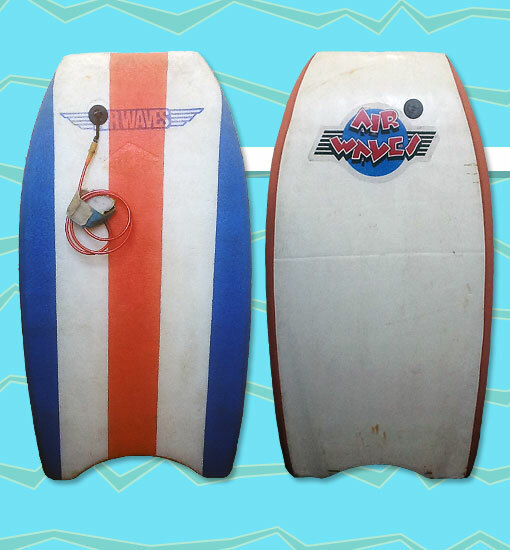 Airwaves bodyboards were "Built to Fly"! Created for J.P. Patterson, one of bodyboarding's first pro riders, the J.P. Model was a boutique bodyboard that was ahead of its time with features such as channels and slick skin rails. The red, white, and blue stripes made it a recognizable board that could be easily spotted in the lineup from the beach. The first generation J.P. Model shown here was made in Huntington Beach and featured the company logo branded in the crescent tail. Photo: Bryan Simmons.